Treadmill walking is effective way to burn extra calories and achieve a healthy lifestyle. Intense exercise is not the only way to burn calories, studies show that a 2 mile (3.2 kilometer) walk every day achieves the same results as intense exercise of any technique; and will use the same calories and give you an equivalent aerobic workout. Scientific studies also show that adults who engage in regular moderate activity (enough to burn at least 200 calories a day) can expect many of the health benefits of exercise from a public health perspective. Walking can be boring especially if you are beginner, but as you gain fitness it becomes a part of your daily fitness activity life. When walking on a treadmill you can eliminate boredom by watching your Favorite TV show; listening to music; or reading. My personal favorite way to reduce boredom is to listen to my personal trainer through my ipod - you can use mine too - try it here. Walking on a treadmill is easiest and most effective of regular exercise, it is simple exercise that anyone can do and stay with, see results and enjoy. Unlike outdoor walking, treadmill walking exercise has the benefits of shock absorption, heart rate control, and the convenience of exercising in your own home. The benefit of treadmill walking is to improve your mental health, walking improves your spatial awareness and ability to balance because you balance on one foot with each step. The ability to avoid losing your balance, tripping, twisting an ankle, or falling requires control and training of your prioception, the ability of smaller muscles such as those in your legs and ankles to send accurate messages to nerves and other muscles to keep upright. Balance is something we take for granted; but it takes training and practice, just like everything else in life. Several scientific researches have shown that regular walking such as treadmill walking will improve and maintain fitness and health. Walking affects the five components of fitness. According to an early study at the University of Massachusetts medical school, walking four times a week 45 minutes each time, the average person can expect to lose 18 pounds in a year with no change in diet. Therefore walking can help you loose body fat as well as tone your muscles. Walking at any speed and pace, two or three times a week for at least 20 minutes increases cardiovascular strength. By increasing the strength of your heart and lungs, you increase your ability not only to exercise longer and harder but also to perform everyday tasks without tiring. Unlike intense aerobic workout, walkers develop a moderate amount of endurance which enables them to workout longer before becoming exhausted; walking helps build your ability to do something longer without fatigue. For flexibility purpose walking is excellent for beginners as it is low intense workout, muscular use is less compare to running and jogging. 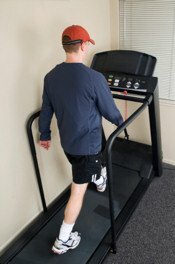 Simple treadmill walking workout can gain muscular strength with walking, but probably not enough for well rounded fitness. Don't hold on the handrails of the treadmill as it doesn't allow you to move naturally, It also won't allow you to achieve good walking posture. Begin to walk on a slower pace until you feel comfortable and secure with the treadmill and slowly increase the pace according to your comfort and safety. You will be getting a better workout at a slower pace without holding on, rather than you would at a faster pace holding on. For those who have disability such as low vision, balance issues and etc, you do need to hold on the handrails as it is safer for you. Consult with your trainer or physical therapist for the best way to achieve good walking posture even if you do need to use the handrails. Avoid hunching shoulders and looking down, it creates a very bad habit of walking posture. These bad habits are usually enforced if the treadmill has entertainment features such as tv or dvd player built it. The correct walking position is with the head up and eyes forward. It is advisable to always look straight ahead and have your tv in front of you rather than looking down. Hunching shoulders can lead to low back pain, neck and shoulder pain, and doesn't allow you to take full, complete breaths. It also reinforces the bad sitting posture many of us have from hours in front of the computer. Your time on the treadmill should be spent building good posture habits, not contributing to the damage you already do to yourself the rest of the day. Treadmill walking is great way to stay in shape and loose pounds, if you not used to treadmills take time to learn them and read the manual before jump on them. Schedule your workout based on your pace, intensity and needs, if you need to figure out what type of workout you require consult with your personal trainer. Avoid holding on the handrails, it can give you a bad posture which can lead to back injuries.